Machine Guarding on the Shop Press – Do you have what you need in place? Recently enforcement was seen surrounding a shop press. A dealership received an OSHA inspection and the shop press was cited for not providing a hazard control (guard) on the press. The hazard is that when the press is used, it is putting (literally) tons of pressure on an object. If that object breaks or is not set right, it could fire out of the press. OSHA regulations require that if an employee could be subjected to that type of a hazard then the hazard needs to be controlled. This is an operation which has rarely seen any type of enforcement in the past. A representative from OSHA indicated that the machine has the potential for the item being pressed to explode and throw shrapnel at the user. Therefore, it needs a guard. What type of guard? What needs done? Those were some of the questions being asked by the dealership. 1910.212(a)(1) – One or more methods of machine guarding shall be provided to protect the operator and other employees in the machine area from hazards such as those created by point of operation, ingoing nip points, rotating parts, flying chips and sparks. 1910.212(a)(2) – Guards shall be affixed to the machine where possible and secured elsewhere if for any reason attachment to the machine is not possible. The guard shall be such that it does not offer an accident hazard in itself. Machine guarding applies to other pieces of equipment in the dealership as well, including but not limited to, the bench grinder, a drill press, compressor belts, car wash motor belts, fan guards, etc. 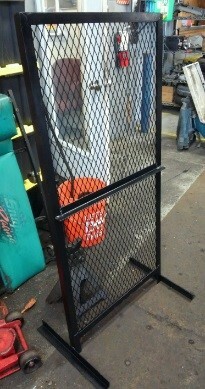 Included are some pictures of example guards for the shop press that can be implemented to suffice the OSHA regulation. This can be a steel fence type of guard, a chain curtain type of guard, a shield type of guard, etc. The most important part is that the guard will protect the employee while operating the machine. If you have any further questions, KPA offers safety materials and training programs for multiple topics, including Machine Guarding. Contact us to learn more about KPA’s available resources.